This document has been developed by "The Sphere Project". 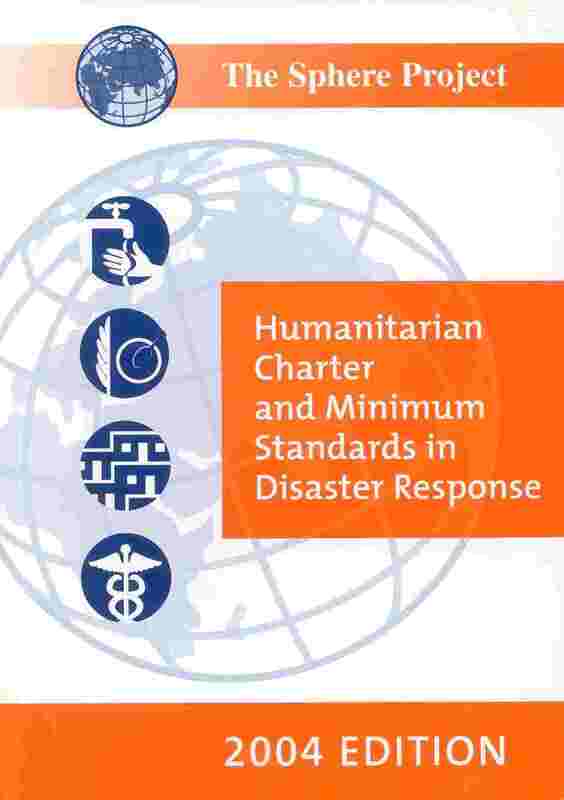 In a remarkable international initiative aimed at improving the effectiveness and accountability of disaster response, the Sphere Humanitarian Charter and Minimum Standards in Disaster Response sets out for the first time what people affected by disasters have a right to expect from humanitarian assistance. The aim of the Project is to improve the quality of assistance provided to people affected by disasters, and to enhance the accountability of the humanitarian system in disaster response. This new edition of the handbook (2004) has been thoroughly revised and updated, taking into account recent developments in humanitarian practice in wat/san, food, shelter and health, together with feedback from practitioners in the field, research institutes and cross-cutting experts in protection, gender, children, older people, disabled people, HIV/AIDS and the environment. The revised handbook is the product of an extensive collaborative effort that reflects the collective will and shared experience of the humanitarian community, and its determination to improve on current knowledge in humanitarian assistance programmes.